Register here for the April 29 event Sick of Climate Change? 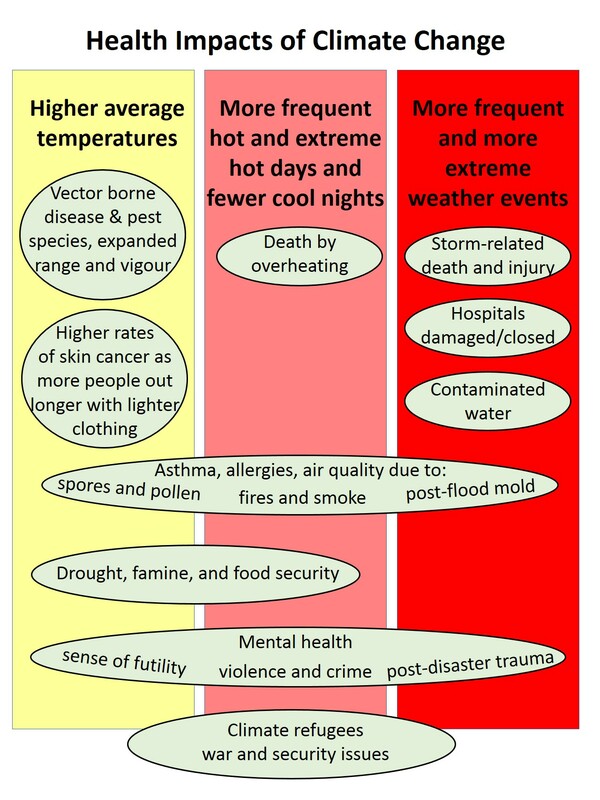 Local Health Impacts in a Warming World. This infographic gives an idea of some of the ways climate change makes us sick, and what it is about climate change that causes those health problems. Death due to storm etc. In one study the number of cases of squamous cell carcinoma was 5.5% higher for every 1°C increment in average temperatures; basal cell carcinoma was 2.9% more common with every 1°C increase. Trillium Hospital in Mississauga had power problems during 2013 downpours and flooding. Hospitals in New York during Sandy and in New Orleans during Katrina – some never reopened. Food growing regions such as California are already experiencing water shortages. Models predict many farming regions where drought is now an occasional problem may begin to desertify.